The American Flaigs: I WILL praise HIM in this storm! Thank you for the update! I love you so much! I am doing my bible study (we are doing Beth Moore's Esther- totally do that one when you get home!) and it is a church of a friend that is offering it. I have your name on their entire church's prayer list, on my blog and anyone who I know will lift your name up to the Lord. You are taken care of, my sister in Christ! 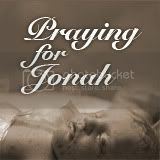 James 5:15 says "And the prayer of faith shall save the sick and the Lord shall raise him up."